It is sort of strange for a comic series to celebrate it’s 46th anniversary, but that seems to be exactly what Dynamite did here for Vampirella #1969. They got an all star list of writers and artists to put together some Vampirella stories covering a wide span of her history. I am a pretty new arrival to Vampirella. She first came to my attention with Nancy Collins terrific run. I have read some of Dynamite’s terrific Vampirella Archives which collect her older series, so I did have some background when I started this book. Originally Vampirella was an alien from the planet Drakulon. In her earliest appearances, she served as the presenter for a variety of horror stories, but over time she started to have her own adventures and cast of characters. Over the years, Vampirella has undergone some drastic retcons, these days Vampirella is from Earth, the daughter of Lilith. Drakulon was just something she was brainwashed into believing. For the most part, Vampirella #1969 goes back to the pre-retcon days and tells stories of a Vampirella who believes she is newly arrived from Drakulon. First off I want to say that $8.00 for 48 pages is ridiculously overpriced. Vampirella is a great character, but we have to be honest, she has niche popularity at best. ICW estimated that Vampirella sold around 6000 copies in August (the last issue). Anniversary books like this can be a great way to bring in new readers, especially since Vampirella has a new series launching in a few months by Kate Leth. But when you slap a $8 price tag on, you are sending a clear sign to readers to stay away. I am also not sure if it was really a good idea to write new stories set in old Vampirella continuity. As a fairly new reader, I felt a little alienated by what they were doing here. They have characters who appear here with no real explanation of who they are (like Mordecai Pendragon) or why they are so important to Vampirella’s story. This wasn’t the Vampirella I had been reading on a monthly basis. If they were going to do some classic Vampirella stories, maybe they should have actually included some “real” classic stories, and not just new stories set in the old continuity. Now, at this point, you are probably thinking I hated this book. While I did think the concept was flawed, most of the individual stories were actually very good. No real surprise in that, as they definitely got great creative teams to work on them. Nancy Collins’ work on Vampirella made me a fan of the character in the first place. She gives us a story about a Vampirella who is newly arrived on Earth and is lured in by a cult promising her peace and happiness. Seeing a more naïve Vampirella was a great touch. This was a great story to get this book started. I also liked David F. Walker (writer of Shaft and Cyborg)’s story Werewolves of Dixie, who introduced a new character named Mama Legba to Vampirella lore. We didn’t get to see enough of Mama and her undead army, so I really hope that David F. Walker gets a chance to revisit this later on. I would definitely be up for a miniseries that focused more on both characters as long as David F. Walker was writing it. But as much as I love Nancy Collins and David Walker’s writing, the real star of this book was the story “Mercy’s Lullaby” by Eric Trautmann and Brett Weldele. The story was mostly in black and white, and felt more in line with a classic Vampirella comic. The story isn’t so much about Vampirella as about a new character named Mercy and her own struggles with the supernatural. It is a real beautifully done story and stole the show for me. The other two stories here are mostly forgettable. Phil Hester tells a story about Vampirella being abducted by a magician and forced to be a part of his act. I did like that the ending really felt like an old horror comic, but the story on a whole didn’t grab me all that much. And there is a story about Vampirella’s encounter with a biker gang who claims to be devil worshippers. Hint...that doesn’t end well for them. But again, there just wasn't a lot here for me to grab onto as a reader. I will say that the art throughout the book is great. We get a nice variety of art styles that really show off the range of stories possible with Vampirella. Ironicly, the biker story (which was by far my least favorite story in the book) had some of the best art. 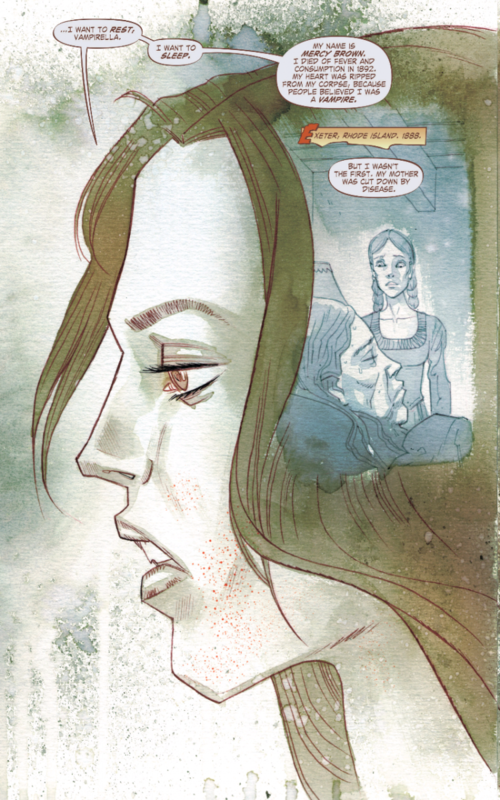 Though again, Mercy’s Lullaby was the best written and drawn story in the collection. All in all, Vampirella #1969 is entertaining, though way overpriced for the page count and content. If you are a Vampirella fan, it may be worth a look, but I’m not sure it’s going to win over any new converts. And even if it does, they will probably be real confused when the series starts early next year since most of this would probably be out of continuity anyway. Three very good stories set in Vampirella's past. Art throughout the entire book is gorgeous. Not quite sure who the audience would be on this. Is it worth your $7.99? Not really. It's a decent collection of stories, but $8 for 48 pages of stories that aren't even in continuity isn't all that great a deal. Vampirella fans might enjoy the book, but I suspect that is a very small audience.